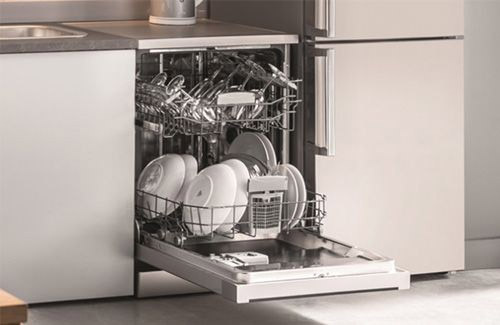 Choosing an Amica dishwasher should be based on your kitchen layout, the space available and whether you want to install an integrated dishwasher into your cabinetry or opt for a freestanding model. There are three different types of dishwasher installation to choose from: freestanding, semi-integrated and fully-integrated. A freestanding dishwasher has its own finished door with a control panel visible on the outside. These models are perfect for customers who want to put a dishwasher in a utility room, prefer appliances to be visible or want to easily move the appliance at a later date. A semi-integrated dishwasher has a décor door fitted to the outside only up to the level of the control panel. The control panel and progress of your dishwasher programme will be on show. This style is ideal for customers who want a coordinated look but still want the functions of their appliance to be visible and easily accessible. A fully-integrated dishwasher is completely hidden in the cabinetry of your kitchen, behind a décor door. The control panel is only visible when you open the dishwasher door, so once the programme has started, you will not see any visual interruption to your kitchen design. This style is preferred by customers who require all the function of a dishwasher but want none of the visual aspects on display in their kitchen. Once you have decided on the style of fitting for your dishwasher, you need to look at the requirements of your family and the size off your kitchen. 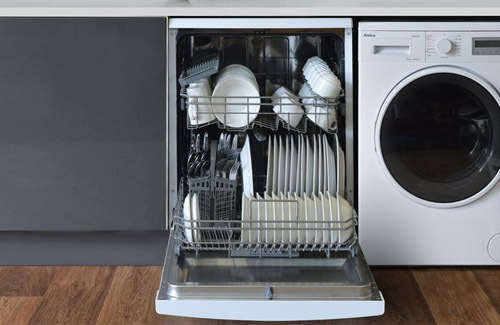 A full-size dishwasher, fitting up to 15 place settings, is 60cm wide on average. A standard kitchen cupboard width is 60cm, if this is not available, there are 45cm slimline dishwasher models available. A slimline dishwasher will take up far less space in your kitchen but is still capable of washing up to 10 place settings. If you are part of a smaller household, or simply use fewer plates and cups every day, then a slimline dishwasher model could be all that you need in your home. There are delay timers that allow you to offset the start time of your appliance so that it runs at night time, for example, when electricity tariffs are low and you are not in your kitchen. A half load setting is an option on many models and allows you to wash only one level in your dishwasher. This is useful when the dishwasher is only half full but you don’t want to leave dirty plates and glasses until it’s full. 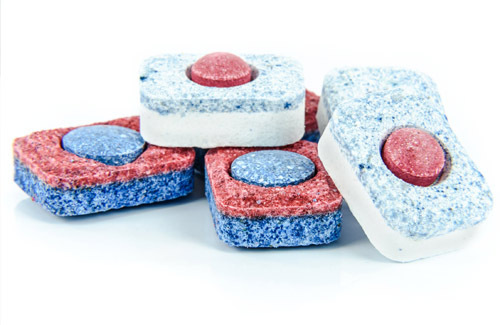 LED salt, rinse aid and progress indicators are handy for checking what is going on in your dishwasher. Often, there are also maintenance indicators, letting you know what you need to do (if anything) to keep it running perfectly. Various programmes are available including: prewash, eco programmes, intensive hot washes, quick washes, glassware programmes, super cleaning programmes and everyday settings for a mixed load. Aqua stop is often built into the design to prevent damage to your kitchen should a problem occur and the appliance floods. This detects if there is an issue and cuts off the water supply. Rather than having a cutlery basket at the bottom of the appliance, some models feature a cutlery tray. 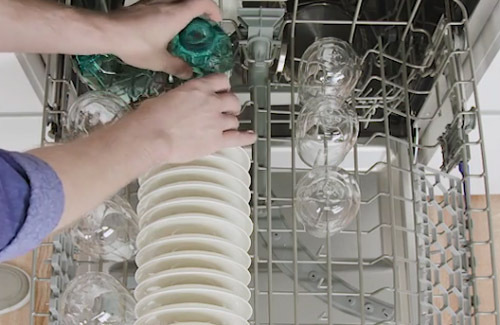 This both frees up extra space in the bottom level of the dishwasher and allows you to spread out the knives, forks and spoons to achieve even better wash results. Active drying systems feature on higher specification models to improve the drying results and speed up the drying time. They use an additional fan to circulate residual hot air in the appliance and get rid of any water droplets. Are dishwashers a standard size? Amica dishwashers come in two widths, 45cm and 60cm wide. This means that you can choose between a slimline model for smaller spaces and a fully sized unit that corresponds to the width of a full kitchen cupboard door. Our dishwashers register at about 45dBA on the decibel meter. As a guide, a bird call is about 40dBA and rainfall is around 50dBA. Pretty quiet, huh? Which dishwashers have 3 racks? The ZWM428W freestanding dishwasher is 45cm wide. The ZWM628W freestanding dishwasher is 60cm wide. The ZIM466E integrated dishwasher is 45cm wide. Which dishwashers have leak protection? All Amica dishwashers are fitted with leak protection as a safety measure for your home if something goes wrong. We have two types of leak protection, a float switch and Aqua Stop. The float switch is located in the bottom part of the dishwasher that holds the water after it is pumped in or drained out. If the water level gets too high, the float switch will prevent more water from entering the reservoir to eliminate the chances of flooding. Aqua Stop is a device that prevents the water inlet from pumping in any water if it detects a problem with your machine, thus preventing any flooding issues. Our dishwashers use water from the cold supply and have an internal pump that heats it to the level required by the wash programme. Are dishwashers good for the environment? You might think that it is more efficient to wash items by hand, but your dishwasher will only use around 9L of water to wash the same amount as the 21L of water you’d use if washing the load by hand. This energy saving is important when energy tariffs are rising and as we become ever more conscious of our environmental impact. Which dishwashers use the least amount of water? All our dishwashers are rated A or above for water usage and energy consumption. The lowest amount of water is used by the ZWM428 slimline dishwasher mode, which uses 8 litres, and the ZWM628 60cm dishwasher model which uses just 10 litres for a full cycle. There are three costs to consider after the initial purchase and installation of your new appliance: the water rates, your energy tariff and the cost of products like tablets, rinse aid and salt. The ZIM688E is rated A+++ for energy usage, making it one of the most efficient on the market. It uses 2800 litres of water per annum on average, which is around half of that used if you washed the same amount of dishes by hand. Water rates vary greatly around the UK, but 1 litre of water usually costs less than 1 pence. This equates to around £28 of water per year. As far as electricity is concerned, the ZIM688E uses around 237 Kilowatts per year which is around £28 per year. The equivalent power required to heat the water to an equivalent temperature and wash this amount by hand is much more, depending on your water heating system. Average figures obtained from www.ukpower.co.uk. Not only are dishwashers easy to use, cheap to run and take away a daily time consuming chore, they are also more efficient and hygienic than washing by hand. Your skin is simply not able to tolerate the water temperatures needed to match those reached in a dishwasher. By using hotter water, the dishwasher is more hygienic for your whole family. The spray arm, fill and drain system in a dishwasher is also cleaner than a bowl of warm, greasy water. There is no need to frequently change the water, prioritise the dirt levels on your plates and cookware or rinse by hand to get everything clean- not to mention the dreaded tea towel…possibly the dirtiest item in our kitchens. With a dishwasher there is no spreading of germs from item to item by drying the plates with a dirty, damp tea towel.